A Tale of Two Garden Parties: Can You Spot the Difference? It’s the time of year to turn up the jets and make a splash in the garden! 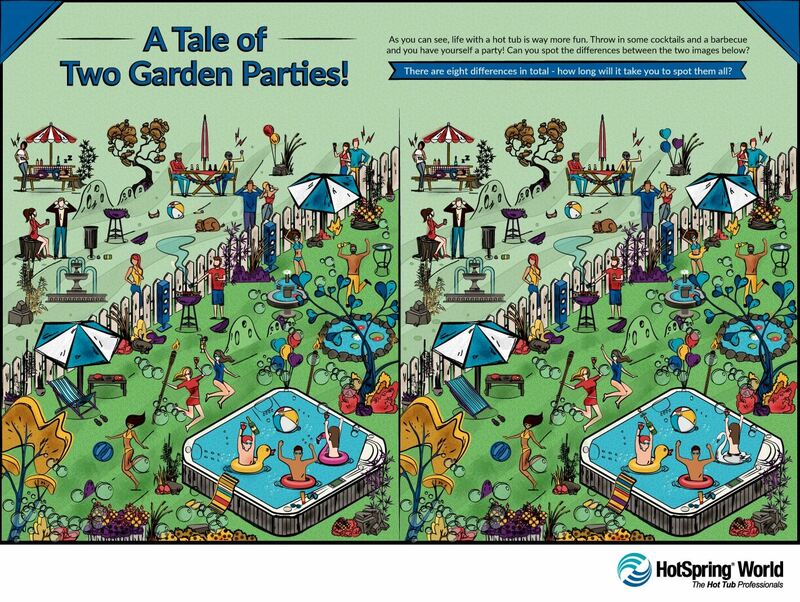 And to get you in the mood for the garden party season, we’ve created a fun and challenging spot the difference brainteaser! From cocktails and flamingos to deck chairs and barbecues, HotSpring World is gearing up for the spring/summer season in a big way. See how long in takes you to find the differences between the two scenes and start thinking about ways to bring your own garden party to life this spring! There are eight differences in total. How long did it take for you to spot them all? It’s taken HotSpring World employees an average of 4 minutes and 32 seconds to find all eight differences! Make your hot tub the focal point of your springtime fun. During the week, use your hot tub to relax and unwind after a long day. When the weekend rolls around, get the BBQ out, put on your favourite hits, invite your friends round and host an unforgettable garden party. With your hot tub as the star of the show, you are sure to impress your guests with a relaxing (if you want to to be) memorable (whether you like it or not) summer fiesta. Get ready for your next backyard barbecue or springtime garden party with free flowing cocktails, a group of your favourite friends and a show-stopping hot tub from our new Limelight Collection. With its elegant features, vibrant lighting and exclusive soothing massage jets, these tubs are sure to impress. And with a range of sizes from 4 to 8 people to choose from, there is space for everyone to get in on the fun! Have a long playlist of music ready to keep the party vibe flowing in and out of the water, and don’t forget to take requests! Whether you were able to find all the differences or not (hint: you can find the answers below! ), one thing is certain – our hot tubs come centre stage and make it easy to entertain and enjoy the great outdoors whatever the weather (though let’s hope for a sunny one!). ANSWERS: 1. Folded deckchair | 2. Different colour stripes on towel | 3. Uncorked champagne bottle | 4. Swan inflatable in hot tub | 5. Extinguished tiki flame | 6. Duck rubber ring on dancing woman | 7. No cocktail in jumping woman’s hand | 8. Different balloons in the boring party scene.